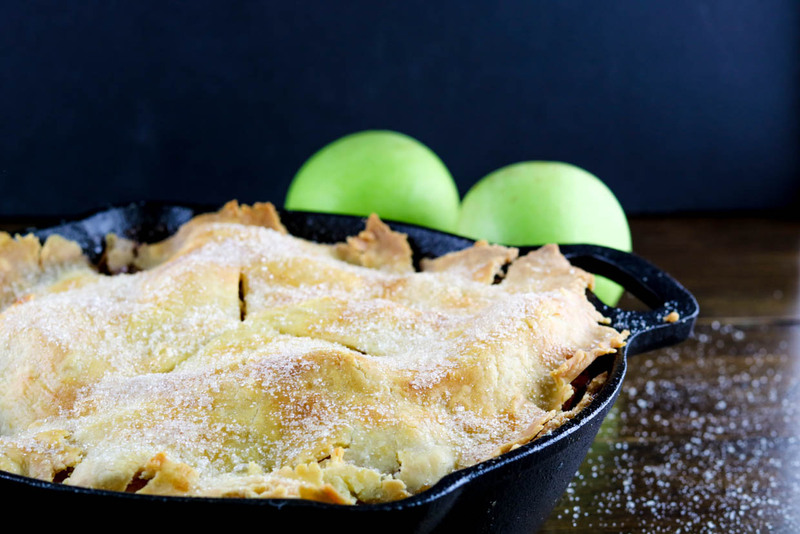 A delicious gluten-free cast iron apple pie that’s super easy to make and just as delicious as any traditional apple pie. 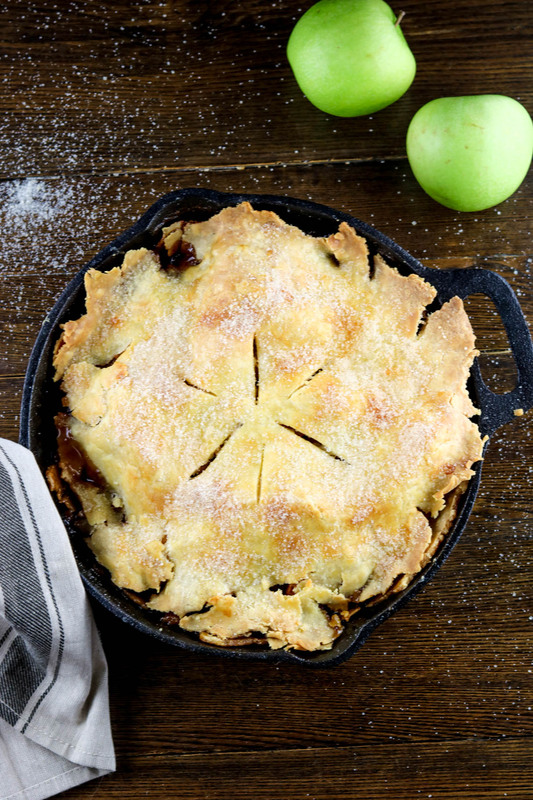 Made with a gluten-free pie crust inside a cast iron skillet. I think sometimes we can easily get in the habit of treating ourselves to gluten-free cookies, cakes, and snacks and desserts made with organic, unrefined sugars thinking we’re still eating healthy. But the truth of the matter is, desserts and sugars, even those with healthier alternative ingredients, should still be consumed in moderation. If you haven’t had a chance to watch the documentary, Fed Up, I highly recommend it. It will open your eyes to the damage sugar can do to our bodies and how the standard American food industry injects sugar and high-fructose ingredients into almost every processed food you can buy. But I digress, we’ll save the “truth about sugar” post for another day. 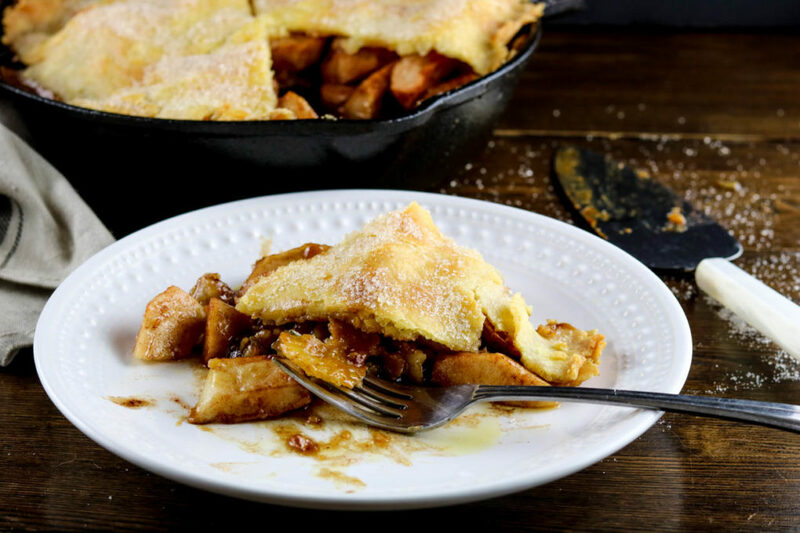 For now, let’s dig into this gorgeous gluten-free cast iron apple pie! If we’re going to indulge in a tasty dessert, why not include a fruit that’s backed by proven health benefits, like apples? Helen Nichols, from Well-Being Secrets, recently wrote an article listing 34 Science-Backed Health Benefits of Apples. This article is jam-packed full of information, you must check it out! When I first started baking gluten-free I was hesitant because baking is such an exact science. If even the slightest ingredient is off you’ll have a baking fail on your hands. Also, baking gluten-free with a nut allergy can be exceptionally challenging. Many gluten-free recipes include nut-based flours such as almond flour. This is actually the driving force behind Wanderlust and Wellness. After years of being frustrated with so many healthy recipes including nuts, nut flours, nut butters, and nut milks I decided to solve the problem for myself (and any other Paleo/Primal eaters with nut allergies) by creating my own gluten-free AND nut-free recipes. 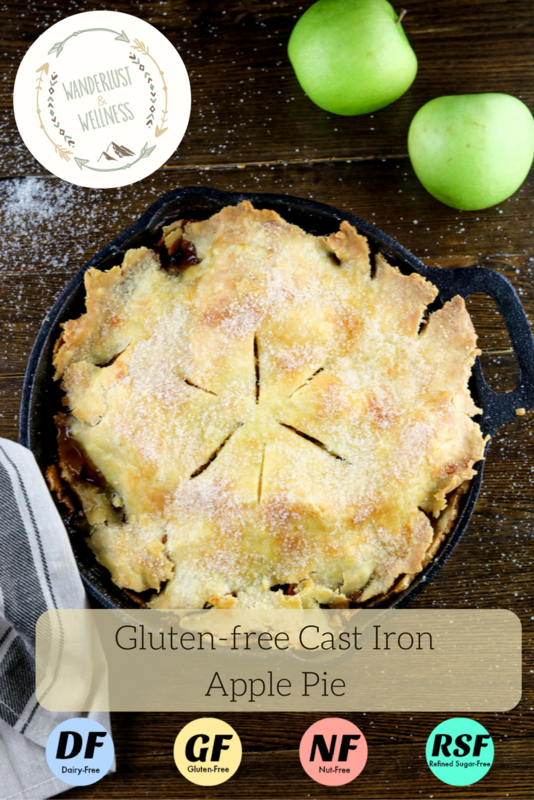 This gluten-free cast iron apple pie uses my favorite gluten-free baking flour, Cup4Cup Multipurpose Gluten-free flour. Make the crust first. Combine the gluten-free flour, salt, and baking powder in a large mixing bowl. Then form dough into a ball, wrap in plastic wrap and place in the refrigerator to chill. Peel apples and cut into wedges. Add to large mixing bowl. Add in cinnamon and 3/4 cup organic cane sugar and toss the apples and sugar together with a spoon. In a 10 in. cast iron skillet, melt the butter over medium heat. Once melted, add in the coconut sugar and stir constantly for about 1 minute until well mixed. The coconut sugar will not completely dissolve. Remove from heat. 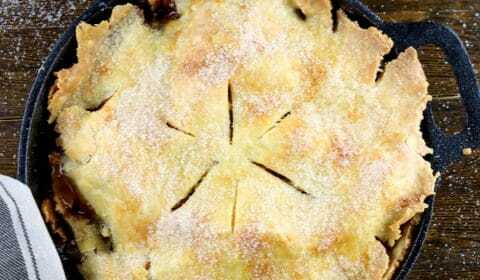 Take pie crust dough out of the refrigerator and divide in half. Place one half of the crust onto parchment paper. Place another sheet of parchment paper on top and using a rolling pin roll out crust until you have about a 12 in. circle. Place the rolled crust into skillet, over the coconut sugar mixture, working the sides up to the top of the skillet. Add apple mixture into the skillet on top of the bottom crust. Take remaining pie crust dough and roll out in the same fashion as before. Place on top of the pie, pinching the edges if you’d like. Cut 5-6 slits in the top, sprinkle on 1 tbsp. organic cane sugar. Bake for 1 hour or until golden brown. Check on the pie around the 45 min. mark to make sure the edges aren’t browning too much. If so, you can add foil to the edges to protect from excessive browning.